Kenneth Cole EZ-Scan Double Gusset Laptop Case. It's easy to conduct business on the road when you have all your essential office items tucked inside a sleek, stylish case. The Kenneth Cole EZ-Scan Checkpoint Friendly Double Gusset Computer Bag features durable Polyester Fabric with dobby trim, large capacity double gusset construction, and multiple compartments for all of your personal and professional items. 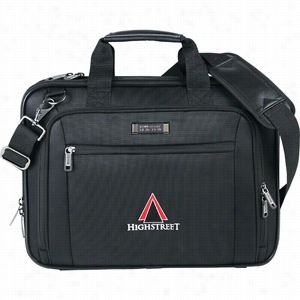 This laptop bag has a rear padded laptop compartment with EZ-Scan feature that makes it easier to move through airport security checkpoints, a front compartment with a padded iPad/tablet pocket, a file divider and two open, padded accessory pockets. A front exterior compartment is loaded with organizer pockets for your cell phone, pens, business cards, and other small devices while comfortable padded top handles and an ergonomic shoulder strap offer versatile carrying options. Trolley sleeve on back for easier transport with luggage. Material: 1680d Polyester. Manufactured By Leeds. Kenneth Cole EZ-Scan Single Gusset Laptop Case. It's easy to conduct business on the road when you have all your essential office items tucked inside a sleek, stylish case. 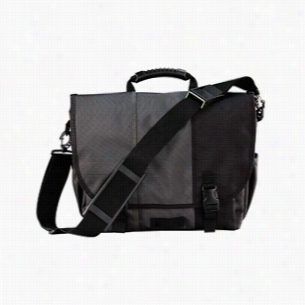 The Kenneth Cole EZ-Scan Checkpoint Friendly Single Gusset Computer Bag features durable polyester fabric with dobby trim, large capacity single gusset construction, and multiple compartments for all of your personal and professional items. 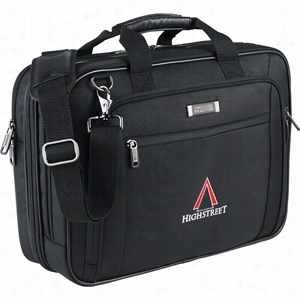 This laptop bag has a rear padded laptop compartment with EZ-Scan feature that makes it easier to move through airport security checkpoints with dedicated iPad/Tablet pocket and zippered organizer pocket for all your cables. A front exterior compartment is loaded with organizer pockets for your iPhone or smartphone, pens, business cards, and other small devices while comfortable padded top handles and an ergonomic shoulder strap offer versatile carrying options. Trolley sleeve on back for easier transport with luggage. Material: 1680d Polyester. Manufactured By Leeds. 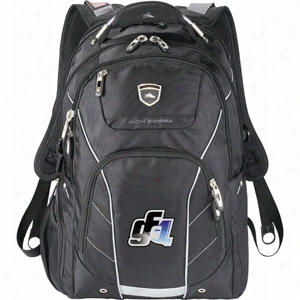 PolyCanvas High Sierra Elite Fly-By Compu-Backpack 17" Laptop. Designed with two large zip compartments; the back compartment includes padded Laptop and tablet sleeve with notch to feed through hydration tube or headphones. Front section features internal organization pockets. Easy access zip-front pocket for phone or glasses and two external water bottle pockets. External bungee cords for stowing additional gear or layers, side cinch straps for easy compression, and sternum strap with hydration system support. Air Mesh Padded Straps and cushioned back panel with spine channel for comfort. Reflective front detailing for safety. Madewith durable 420d material for long wear. Fits most 15"-17" laptops. 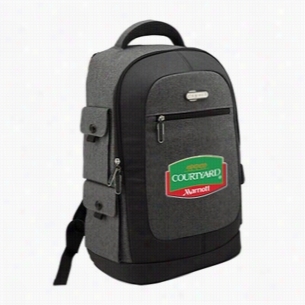 From our SOLAIRE collection, comes this new extra spacious, structured deluxe backpack ideal for professionals and students. 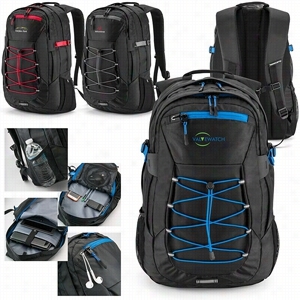 This backpack features numerous organizer pockets inside and out as well as dedicated space for a laptop and electronic tablet devices. 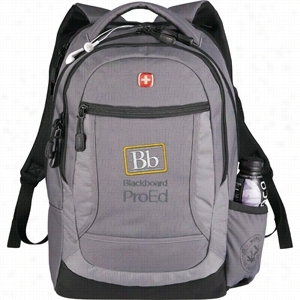 External features include front zippered pocket, 4 gusseted side pockets with Velcro flap closures, 3D mesh padded shoulder straps and an ergonomically designed padded carrying handle. Also features molded compression back as well as shoulder straps for extra comfort, sternum straps for comfortable and secure fit. Made with Polyester material and elegantly accented with SOLAIRE hardware. Black 1680D bag with patterned 210D accent, Large main dual zipper compartment, Front zipper pocket, Separate front zipper pocket with internal organizational panel, TSA friendly zipper Laptop compartment for easy inspection, Large mesh side catch pocket, Top web handle with sturdy plastic guard, Adjustable padded shoulder straps with mesh accent, Sternum strap, Extra padded mesh back panel for lumbar comfort, Front reflective piping accent. Durable 600D black Polyester non-PVC backing material with bold color dobby accent, White piping, Large zipper main compartment, Front zipper pocket, Side zipper Laptop entry, Padded laptop sleeve included, Side mesh catch pocket, Rubber earbud port, Black adjustable shoulder straps, Sturdy padded handle with matching color air mesh accent. 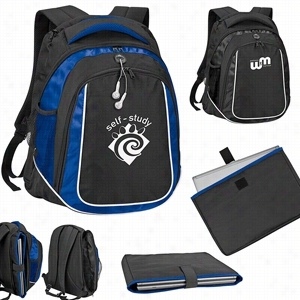 PolyCanvas Wenger Spirit Scan Smart Compu-Backpack 16" Laptop. Liberty Bags Fillmore Messenger Laptop Bag. Designed with two large zip compartments; the front section features internal organization pockets and a key/accessory clip. 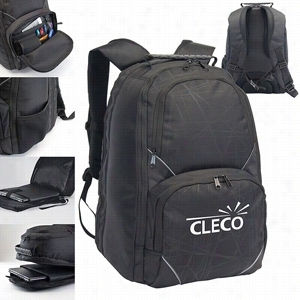 Large back compartment includes padded Laptop and tablet pockets. Interior felt lined sunglass/Phone pocket and two external water bottle pockets. External bungee cords for stowing additional gear or layers. Air Mesh Padded Straps for comfort and reflective front detailing for safety. 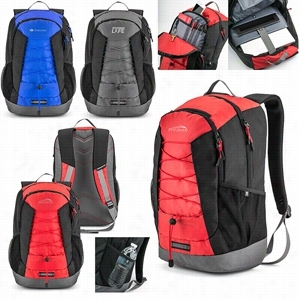 Made with durable 600d/420d/ripstop material for long wear. Fits most 15" - 17" laptops.